Private insurance claims for telehealth services have increased more than 1,200% from 2012 to 2017, Fair Health's data shows. Although ED utilization dropped in 2017, it still was the most-used setting. "Telehealth has become a rather prominent source of service for mental health conditions," said Fair Health President Robin Gelburd, adding that it has broken down the barriers to mental healthcare related to stigma and access. "Telehealth is almost like a living laboratory as the policies and regulations get developed," Gelburd said. Texas, for instance, amended its state laws in 2017 to allow providers to care for patients virtually without first having an in-person meeting. 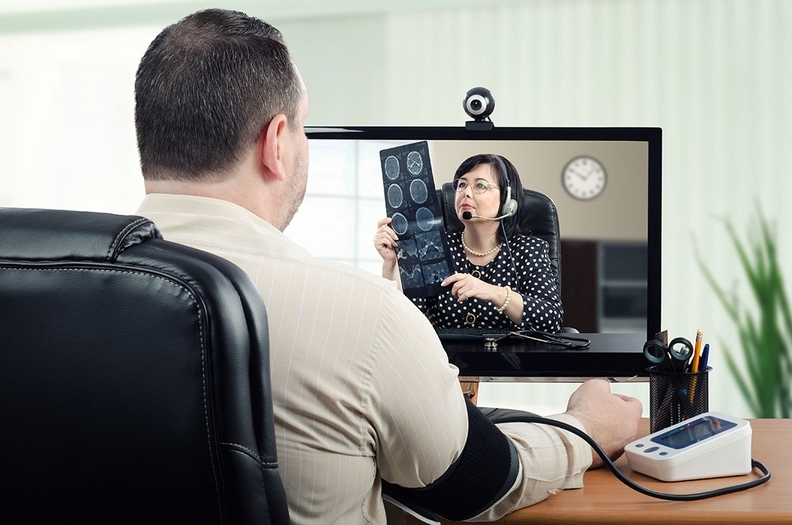 But Medicare pays for telehealth services only if the beneficiary is in a rural area with a shortage of health professionals or lives in a county outside of a metropolitan area. It also limits which providers can bill for such services. Providers who have national licensure compacts can't follow up with patients virtually if the individual is in a noncompact state. "It is really the federal government," said Dr. Jay Sanders, CEO of the Global Telemedicine Group and adjunct professor of medicine at Johns Hopkins University. "They are the ones who need to say for the Medicaid and Medicare patient population, 'I don't care whether you are in the inner city, a suburban or rural area, if you use telemedicine we will reimburse you.' "
Outside of telehealth, retail clinic claims grew 674% from 2012 to 2017, a slower pace than from 2011 to 2016. Rural and urban areas nearly matched in utilization. Most people used retail clinics in 2017 for respiratory infections, which aligned with 2016. Those were followed by exposure to communicable diseases, general symptoms, ear infections, examinations and urinary tract infections. Most people who used retail clinics were age 51 to 60, followed by those age 31 to 40 and pediatric patients. "Looking at a deal like CVS and Aetna, there is a sense that retail clinics will be a very integral and a growing component of the healthcare system," Gelburd said. Still, there is some progress to made in both retail and urgent-care settings regarding communication, staffing levels and data sharing to ensure care isn't duplicated, she said. For urgent-care centers, utilization grew 1,434% from 2008 to 2017, more than seven times that of EDs. Growth in urgent-care use from 2008 to 2017 was slightly higher in rural than in urban areas. But from 2016 to 2017, growth was flat in rural areas compared with 15% in urban areas. As in retail clinics, acute respiratory infections were the most common diagnostic category in urgent-care centers in 2016 and 2017. Those were followed by general symptoms, sprains, strains, breaks and fractures, joint/soft tissue issues, UTIs, other injuries, and ear infections. The age 31-to-40 demographic used urgent care the most, followed by pediatric patients. The average charge of a 15-minute visit was about $60 less at a retail clinic than at an urgent-care center. One can get a good sense of how care is evolving by looking at the distribution of claims by diagnosis, Gelburd said. Retail clinics were predominantly used for vaccines. They are now used more like primary-care outposts for ear or respiratory infections. Telehealth, which was mostly used for mental health and dermatology, is now seeing more respiratory and digestion cases, she said. "We are seeing the evolution in real time and the broadening and blurring of lines between different types of venues," Gelburd said.